With a 14th-place finish in the Ford EcoBoost 200 season-finale for the NASCAR Camping World Truck Series at Homestead-Miami Speedway on Nov. 16, Myatt Snider wrapped up his first full season of competition in the series with Rookie-of-the-Year honors. He wound up ninth in the season-ending standings, highest among drivers who didn’t make the playoffs and highest among the 2018 Truck Series rookie class. Throughout the 2018 Truck Series season, Snider competed against Todd Gilliland for top newcomer. Snider finished the year with a 21-point lead in the rookie standings over his fellow-rookie, 611-590. Gilliland posted four top-fives and nine top-10 finishes to Snider’s three top-fives and eight top-10s, but Snider was able to accumulate more points by running all 23 races on the 2018 schedule to Gilliland’s 19. Snider’s best finish of the year was a second at Talladega (Ala.) Superspeedway in October. Gilliland was unable to run a handful of races at the start of the season because of NASCAR’s age restrictions. 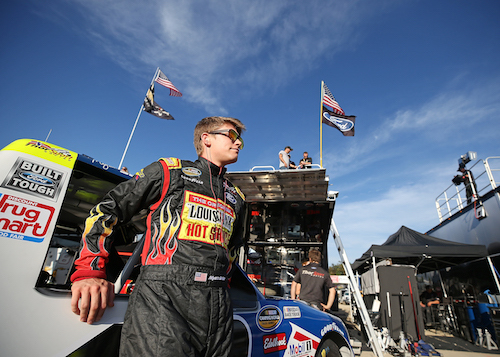 Once Gilliland turned 18 in May, he began competing in the Truck Series full-time. Gilliland finished 10th in the end-of-season, overall, points standings, despite not running four races. Justin Fontaine was the third and final rookie who competed in the Truck Series in 2018. He ran the complete schedule, posting two top-10 finishes.